Staying up to date on all of your vaccines and immunizations will help keep you healthy. Vaccinations are specially formulated to trigger the production of antibodies causing your body to build up immunity to one or more diseases. This means when you come into contact with a particular disease your body recognizes it and is better prepared to fight it off. 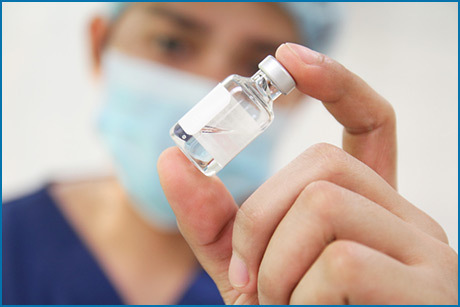 Urgent Medical Center provides standard vaccinations that help protect you against a number of harmful diseases. Vaccines are never 100% guaranteed to prevent infection but are proven to greatly limit your risk of infection as well as reduce severity if you do become infected. Everyone needs vaccinations at different times throughout life including young children, the elderly and everyone in between. Some antibodies remain with you forever, while others fade over time. This is why some vaccinations are only required once in a lifetime, while others should be administered regularly every so many years. For instance, the flu shot must be given annually to remain effective, largely because new flu strains arrive every year. The CDC highly recommends certain vaccinations including influenza (flu), tetanus, diphtheria, and pertussis. It is recommended for older adults to get vaccinated against shingles and pneumococcal disease. If you are diabetic it is recommended to get a vaccine against hepatitis B. There are also optional vaccines such as Gardasil, which protects against HPV (human papilloma virus), a known contributor to certain cancers. Urgent Medical Center is here to help you stay on track of the vaccines you need. If you are ever unsure if you need a certain vaccine or not, a simple blood test can detect the appropriate answer. All vaccines marked with * need to be ordered as needed and may require a deposit. We recommend calling in ahead of time to ensure we have exactly what you need before you arrive. We never overcharge for vaccinations, they are already expensive as it is and so we do our best to keep costs down for our patients. Do you have a UMC Membership? If so, you will enjoy additional discounts up to 10%.